Muslims converting to Christianity is a thorny issue almost anywhere in the world, but recently U.K. media attention has focused in on the persecution of former Muslims not in foreign land but in its own backyard. Former Muslims who convert to Christianity are threatened with disownment and violence at the hands of their own family members – much like in parts of the Middle East. But the difference is these families don’t reside in a theocratic society, but in a western country that upholds religious freedom – including the right to convert to another faith. BBC, U.K.’s leading news network, featured several stories and programs in recent months devoted to the issue of persecution of Christian converts from Islam. In its latest feature on Monday, it highlighted real cases of England-based Muslims who convert to Christianity and the consequences that follow. Sophia (not her real name) is from a Pakistani background but lives in east London. Her family has put extreme pressure on her to return to Islam since she converted to Christianity. “They kept saying, ‘The punishment is death, do you know the punishment is death?” she recalled to BBC. She ended up running away from home, but her mother found her and showed up at her baptism. “I got up to get baptized, that’s when my mother got up, ran to the front and tried to pull me out of the water,” Sophia said. “My brother was really angry. He reacted and phoned me on my mobile and just said, ‘I’m coming down to burn that church,’” she remembered. Another U.K. convert case is Ziya Meral, who was disowned by his parents when they found out about his conversion. Meral’s case is slightly different from Sophia because he was born and raised in Turey. His family still remains there. He went to England to study at a university and later became a follower of Jesus Christ. He had planned to gently break the news to his parents, but instead they found out when they saw him on national news being described as “an evil missionary” intent on “brainwashing” Turkish children. The wild story was based on a clip of Meral eating at a Christian summer camp right before heading back to Turkey. For converts such as Sophia and Meral, there is widespread belief by Muslims around the world that they should be punished by death. A poll conducted by the Policy Exchange last year suggested that over a third of young British Muslims believe that the death penalty should be used for apostasy. But several highly respected Muslim scholars are saying that the Quran does not say apostates must be punished by death. Rather, the teaching is from hadiths, or recorded traditions and sayings of the Muslim prophet Muhammad. Usama Hassan, a Cambridge-educated scientist and an imam, contends that classical scholars were wrong in how they interpreted the Quran. He firmly denounces those who advocate the death penalty. "I believe the classical law of apostasy in Islam is wrong and based on a misunderstanding of the original sources, because the Quran and Hadith don't actually talk about a death penalty for apostasy," Hassan argues. Last year, Egypt’s top religious advisor, the Grand Mufti Ali Gomaa, also said Muslims are free to change their religion and should not be given worldly punishment because it “is a matter between an individual and God,” according to Agence France-Presse. Former Muslim turned Christian leader, Dr. Patrick Sookhdeo of the Barnabas Fund, said he is “delighted” to see the British media zoom in on the issue of conversion from Islam and the persecution of former Muslims. “As a convert from Islam myself, part of my life’s work has been to seek to see this most cruel of laws removed from Islam, and to see that Christians like myself are given freedom to choose and believe without facing persecution and possibly death,” Sookhdeo wrote in a Barnabas e-mail newsletter Monday. The Islam expert – who advises British, American, and NATO military officials on jihadist ideology – called on Christians to pray that there will be real progress in religious freedom for former Muslims in the world. The Eritrean government is one of the top persecutors of Christians in the world.The government is dismantling the Orthodox Church by sending the clergy of the church to military training camps, a persecution watchdog group reported. የኤርትራ መንግሥት ከዚህ ቀድሞ ፓትርያርኩን በማሰር አዲስ ፓትርያርክ መሾሙ ይታወሳል፡፡ ይህንን ቅጥ ያጣ ተግባር የተቃወመችው የካቶሊክ ቤተ ክርስቲያን ብቻ ስትሆን ኦርቶዶክሳውኑ ግን መስማማታቸው ተዘግቧል፡፡ Here is the whole press release as posted on their website. The Eritrean officials are forcefully sending clergy of the Eritrean Orthodox Church to military training camps. As a consequence, Eritrean Orthodox churches throughout the country are losing their leaders. At the end of 2006, the Eritrean government informed churches of its decision to rescind a long-standing exemption of clerics from compulsory military service. The Roman Catholic Church in Eritrea was the only church to express vehement and public opposition to this unprecedented action. In contrast, the top leaders of the Eritrean Orthodox Church, who have been hand-picked by the government, embraced the new policy with open arms. Eritrean officials are now forcibly recruiting church ministers into military service on a wide scale. On March 24, 2008, Eritrean officials issued replacement identity cards to a limited number of the church’s priests and deacons, exempting them from military training. The vast majority of the church’s leaders, however, who did not receive updated identity cards, are now required to go to military training camps. The largest Eritrean Orthodox Church in the country, St. Mary, in the capital city, Asmara, had 96 ministers, but only 10 of them were issued IDs that exempted them from military training. Similarly, in rural areas, where most Orthodox churches are located, the maximum number of priests and deacons allowed to serve in any church is 10. The rest are expected to report for military service if they are under the age of 50. In addition to churches, the new campaign also forces many in Orthodox monasteries to be conscripted into the army. In the past, The Eritrean government has usually directed its animosity for Christians against the “unregistered churches,” which are mainly evangelical. Over half a dozen denominations have been closed since May 2002. Many of their pastors and 2,000 - 3,000 of their adherents are still locked up in prisons, military barracks, and shockingly metal shipping containers. None of these prisoners have been charged with a crime or even seen the inside of a court room. Reports from prisoners who have been freed indicate that they are held under deplorable conditions. However, in the last two years, the government has also turned its attention on the Eritrean Orthodox Church, the oldest and most established religious institution in Eritrea. Almost 45% of the Eritrean population belongs to the Eritrean Orthodox Church. Nearly four years ago, the government began a campaign against the leaders of the Orthodox Church, especially those who were attracting increasingly larger followings of young people. The leaders of the church who have since been locked up in Eritrean jails include: Dr. Fistum Ghebrenegus, Dr. Tecleab Menghisteab, Rev. Gebremedhin Gebregiorgis, and Merigeta Ytbarek Berhe. Two years ago, His Holiness Patriarch Antonios, then head of the Eritrean Orthodox Church, became the best known religious figure to criticize the government’s interference in church affairs. The government responded by replacing him with a hand-picked pontiff. Patriarch Antonios has been under strict house arrest since then. According to some observers of the Eritrean government, the forced conscription of Eritrean Orthodox clergy represents a systematic dismantling of the Eritrean Orthodox Church, one of the most important pillars of Eritrean society. ICC calls on Eritrean government officials to stop interfering with the affairs of the Eritrean Orthodox Church, and to instead release all Christians who are imprisoned for their religious beliefs. 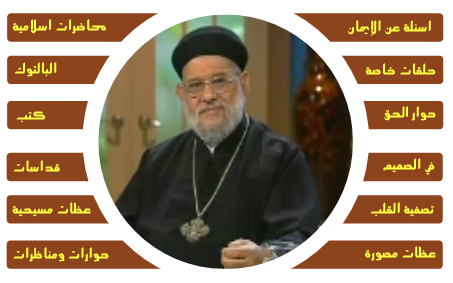 On channel al-Hayat, or “Life TV,” you will find Father Botros, a Coptic priest, discussing theology in a way that embarrasses—and enrages—Muslim leaders. His television talks are leading not only to mass conversions, but to the disempowering of radical Islam. Recently in National Review Online, Raymond Ibrahim described the work of Father Botros. He is a bearded, bespectacled cleric who sports a large wooden cross, and his specialty is examining “little-known but embarrassing aspects of Islamic law and tradition,” Ibrahim writes. Because he speaks and reads classical Arabic, Botros can “report to the average Muslim on the discrepancies” and what Ibrahim calls “the affronts to moral common sense found” within Islamic teachings. Satellite TV and the Internet mean Butros can question Islam’s teachings in Arabic—the language of 200 million Muslims—without fear of reprisal. Naturally, this drives the sheiks crazy—which is probably why there is a rumored $5 million price on his head. Botros’s ultimate goal is “to draw Muslims away from the dead legalism of sharia law to the spirituality of Christianity.” In doing so, he is not only saving souls, but cutting at the very heart of radical Islam. This is why, at the end of each program, Botros reads from the Bible and invites his listeners to follow Christ. That he is successful in this endeavor is acknowledged by none other than al-Jazeera, which complains of Botros’s “unprecedented evangelical raid” on the Muslim world. Botros offers a great example of why we Christians must learn our own doctrines, along with those of other religions: so that we can lovingly reason with people and draw them into the kingdom of God. Tune in tomorrow for more on how you can witness to Muslims—even if you do not star in your own television show. And do not forget to pray for the safety of “Public Enemy Number One,” who is doing a great work for the kingdom—in the heart of radical Islam. This is our holy week. We remind ourselves about the sufferings of Christ for us. 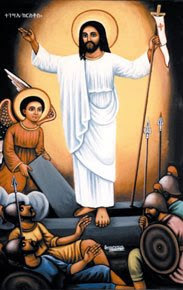 Especially in the Ethiopian Orthodox, the clergy and the laity alike practically partake His suffering through protrations, with the sad melody of the week (LISTEN HERE) saying "Power, Respect and Praise be unto You O Christ!!!" (ለከ ኃይል፣ ክብር ወስብሐት) and also consuming less food and reading more scriptures. What does this week really mean to us? READ HERE. The seventh Sunday in the Great Lent is known as “Hosanna Sunday” or “Palm Sunday”. The word “Hosanna” is Greek and is derived from the Hebrew word “Ho-sha-a-nan” which means “Save us”. It is the word that the Jewish multitude said in welcoming Our Lord Jesus Christ as King during His entry to Jerusalem. The word “Palm” came from the way the multitude welcomed Our Lord by using palm and olive branches. From here came the naming of this Sunday as Palm Sunday. 1. HOSANNA by Archbishop Abune Gabriel: READ HERE. After Hoassa comes the Holy Week of Semune Himmammat. Here you have Treasure Map of the Week. Click on the picture to enlarge. Melkam Yeteqedese Sament Yehun, Amen. የኢትዮጵያ ኦርቶዶክስ መሪዎች የግብፅን መሪዎች ሲያስተናግዱ እንደ 1920ዎቹ ጳጳስ እንዲሾሙላቸው ለመማፀን አይደለም፡፡ በዚያን ጊዜ ፓትርያሪኩ አቡነ ዮሐንስ ለእጨጌ ገብረ ጊዮርጊስ ጵጵስና እንዲሰጡ ለማድረግ በመንግሥት ደረጃ ስንት ድካም ተከፍሎበት ነበር፡፡ ዛሬዎች የቤተክርስቲያን መሪዎች የሚያስቸግራቸው በእየሩሳሌም ገዳም ባለቤት ላይ ያለውን አታካራ የመቅጨት ጥያቄ ይሆናል፡፡ ያም ቢሆን የግብፅ መንግሥት እጅ አለበት፡፡ ስለዚህ ሁሉም ነገር ውስብስብ ነው፡፡ ግን በተለምዶ እንደሚደረገው ርችት ተኩሶ በፈገግታ መቀበልና መሸኘት አይቀርም፡፡ ግን ለጉብኝታቸው የሁዳዴው ፆም የተመረጠው ስለምን ይሆን? In an historical move for the two sisterly Churches, heads of Ethiopian and Coptic Churches sign protocol of understanding and agreement in their future services. The articles are introductory and first steps for these ancient Churches. We applaud the result as God's miracle during the time when Christianity in this part of Africa is at a critical stage. The Ethiopian Church of course should learn alot from its Coptic counterpart. Ethiopian Christians has shown their love and devotion for a religious father by flocking in thousands to welcome His Holiness Pope Shenouda. We do not witness such reverence to any of our local fathers these days. Our patriarch is one of the despised personality in Ethiopia. It is a very heartening fact to mention. But it is true. As the saying goes, we may not like our patriarch but we love our Church. We love our mother Church till our last breath, but we obey our fathers if and only if they deserve it. I think His Holiness the patriarch should learn this fact from Pope Shenouda's visit and Ethiopians' reaction. Thus, let our fathers do mother Church a favor. 2. Listen to what the believers are saying. 3. March only for the Cross. 3. As Pope Shenouda said, the patriarchal position is not a power, it is a duty & service. THANK GOD MAHIBERE KIDUSAN. GOD BLESS. Note: For a better view, click on the picture. Many centuries old Ethiopian forest devastated by wild fire. The News has been reported here quite for sometime. Here is an advertisement for prayer and worship in our Church here in Washington DC Saint Mariam Church. Please post so that people know about the program. First of all I would like to say you have done a super job with this recent incident on our church .You have made us well aware and current with what is happening. I would like thank Mahibere Kidusan for the great effort and with God's help has been able to aware and mobilize people to do such an incredible job. All this have been with the help of Medhane Alem. Because for a fire that has destroyed $11500.00 hectare of land was stopped 500.00 meters away from the Church. Praise be to Him. 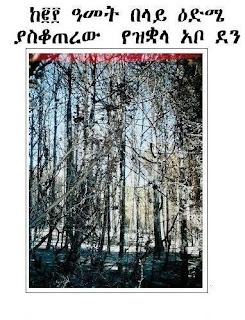 The overall attack (Natural or Human caused) has been a shock and very devastating for me personally and any Ethiopian for that matter I believe .The (30,000.00 + 11,500.00) hectare forest we have lost was an asset for the country such as these would take more than hundreds of years who knows some of trees would have been more that 700 years right from the time the monastery was established. 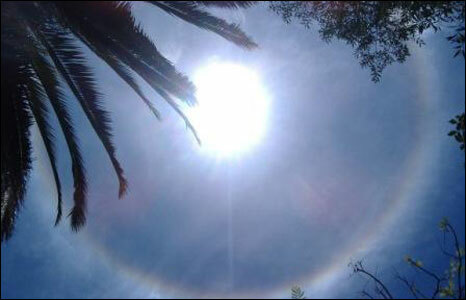 As a whole these were forests that contribute a lot for the atmosphere of the Semi sub-Saharan land of our country. So why other bodies of the country did kept so quiet. 1. Why did the Government act as expected? 2. Why did the Protestants and the Catholics keep quiet about the incidents? Does these incident pave the way for wide spreading fiction based US and Norway funded Churches? 3.Why did the Muslims in Ethiopia keep so quite? With Harar being the fourth holy place for the muslims, will this be an opportunity to irradicate Christians from their “holy land”? I am deeply touched by the sad report we just got. I just called few brothers who are at the Asebot Debre Wegeg Kidist Selassie Church and Abba Samuel monastery fighting the fire and also talked to a father in the monastery, about the situation. The fire started 20 days ago and has consumed about 11,000 ha of the monastery forest. But who started the fire? This is not the first time that the monastery is challenged; not only by fire but also by enemy of the Church. It is the only monastery we have in eastern Ethiopia and even Siad Barre of Somalia targeted to destroy it during the war with Ethiopia in 1969-70 EC. Islamic Oromo movement attempted to attack it in 1984 EC. Every time our God miraculously saved the monastery from total disaster. Coming back to the issue at hand, during my discussion with a certain father, he extended the following message to us in the Diaspora. meter from the core monastery. 2. The pasture (grazing field) of the cattle of the monastery is totally destroyed and now they are facing great shortage of fodder. 3. Mahibere Kidusan and West Harerghe diocese laity did a remarkable job by being in the front and by organizing the laity to fight the fire. 4. The very poor road structure has made the effort to fight the fire very hard and time consuming as most vehicles could not made it through. He underlined that we should not get panic by the situation, instead, be calm and pray to God. The only way out. that the monastery covers the cost of fuel and allowance for drivers.